Cupid Valley is a ski and snowboard resort located in the south-western region of Niigata Prefecture, geographically between the famous Myoko and Yuzawa-Minamiuonuma regions of the same prefecture. With a gondola lift and a 4km long course, the often deep powder conditions and some unique looking scenery looking north towards the Japan Sea coastline are popular with people coming from afar. The Ski Center at base covers all your needs for a day or more on the slopes with restaurants, rental and lessons available and the large public 'Yuki-no-yu' onsen hot spring baths are very popular. There is also accommodation available by the base for those staying longer including the Cupid Valley long house hotel and ryokan. 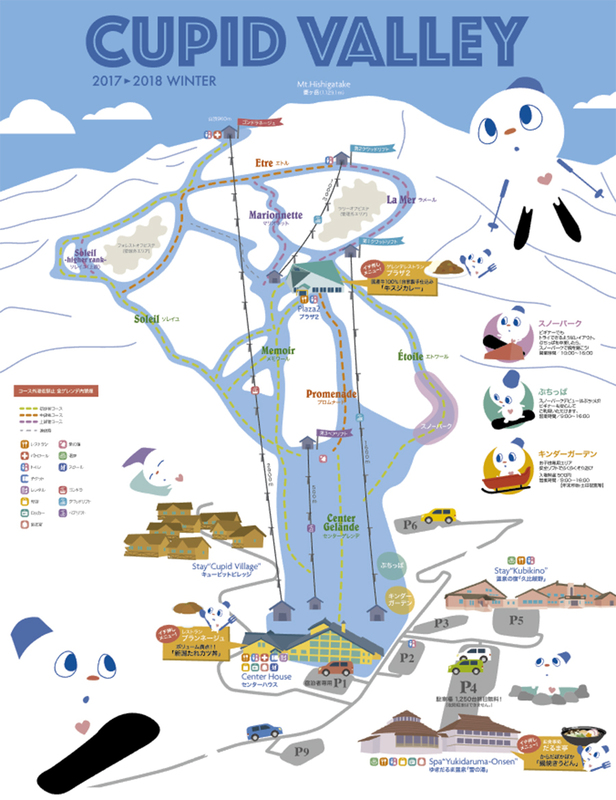 The region is known as 'Yukidaruma Kogen' which roughly translates as Snowmans Plateau. There's certainly usually enough snow each season to have an almost endless supply of snowmen! Resort statistics, reviews and daily-updated weather and snow forecasts for Cupid Valley can be found here. Cupid Valley is located in Joetsu city in the south-western region of Niigata Prefecture. With the Free Change System you can change between skis, snowboards, carving skis and fun skis during the rental period. Note that small items such as hats, goggles and gloves are not available to rent. After a day on the slopes, what better than to have a good long soak in the naturel onsen hot springs at 'Yukidaruma Onsen'. Located right at the base of the ski resort, there's a few different bathing facilities to choose from as well as a restaurant and shop. Entry is 600 yen for adults, 500 yen for children of elementary school age and 200 yen for infants. Children taking 'Hajimete Lesson' can ride the lifts for free for the duration of the lessons.